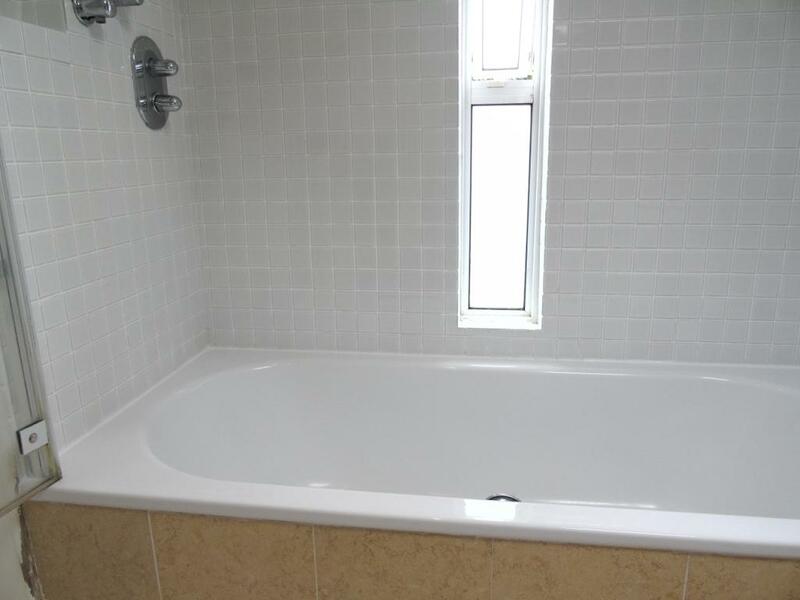 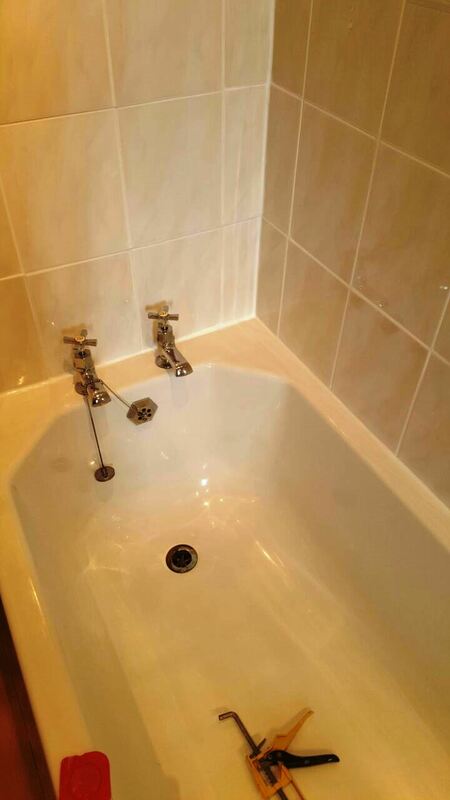 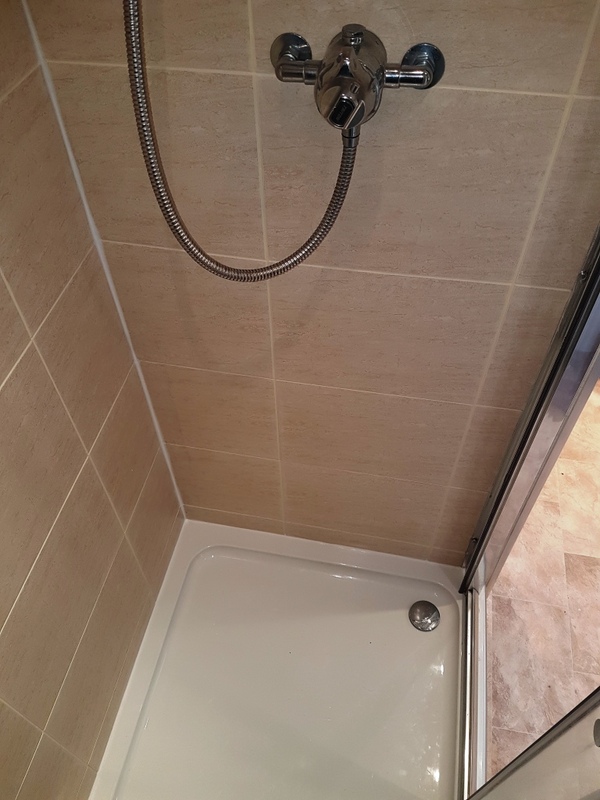 This bath with shower over was located at a rental property in the town of Chessington that had been recently vacated by students. 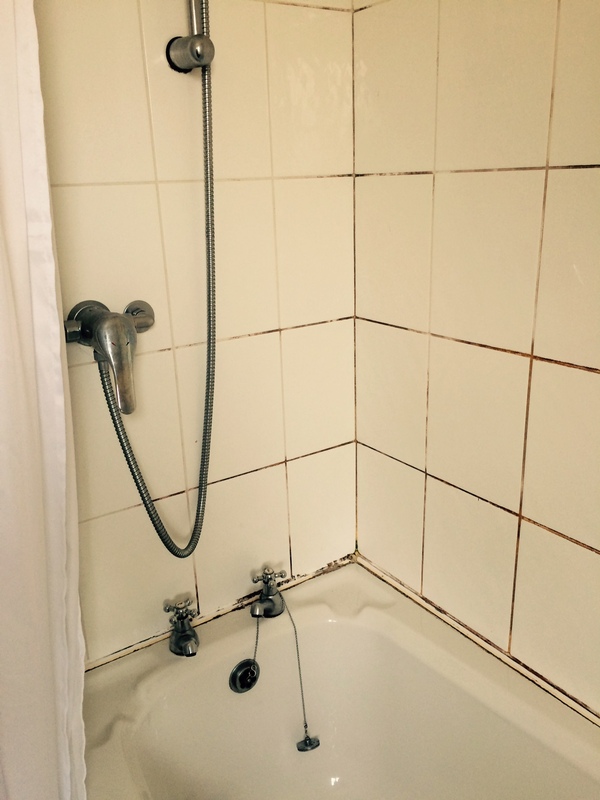 I was called in by the landlord who was looking to re-rent the property. 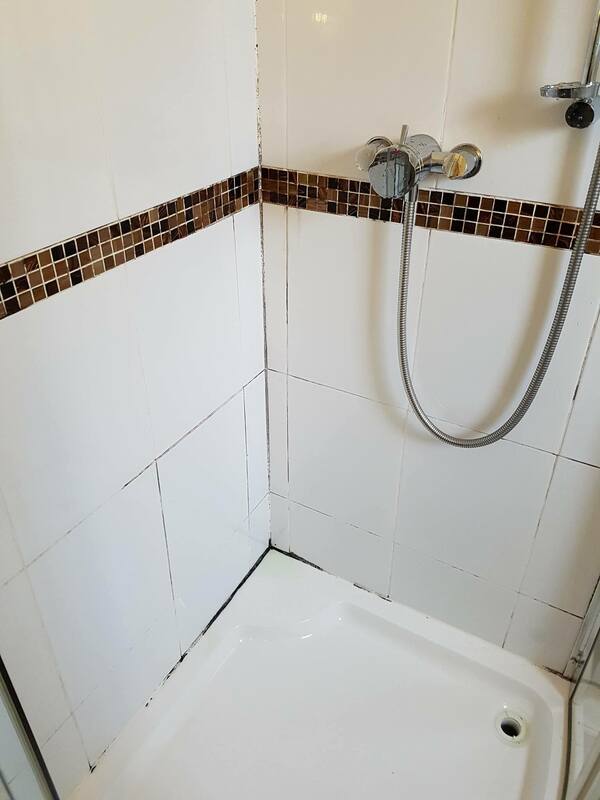 The request was to tidy up the ceramic tiles in the shower and bath area and to make it look decent again for the next batch of soap-dodgers. 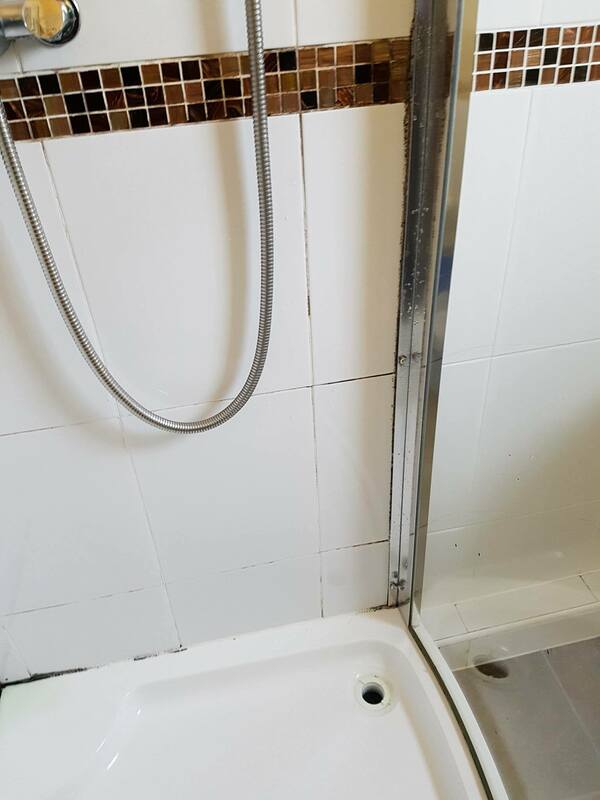 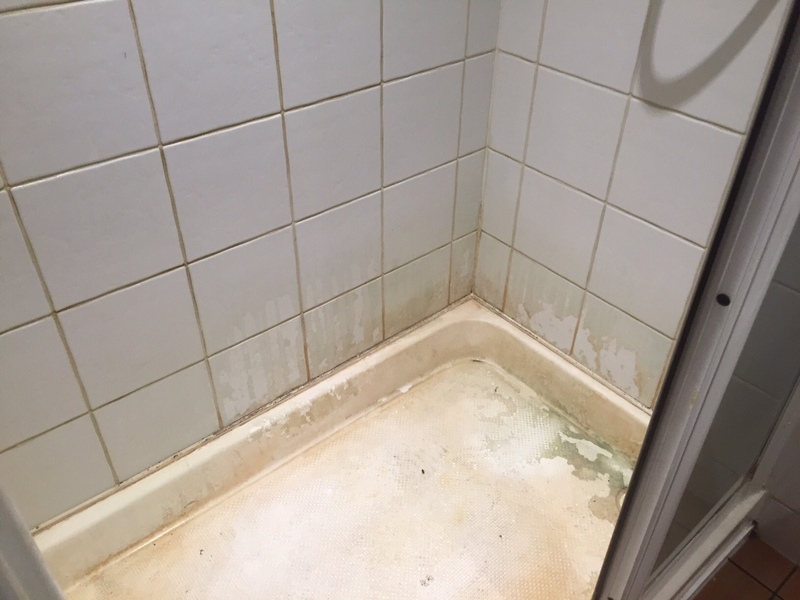 We often get asked to do end of tenancy tile cleans and have seen a lot worse than this one so I was confident it could be made to look like new again. 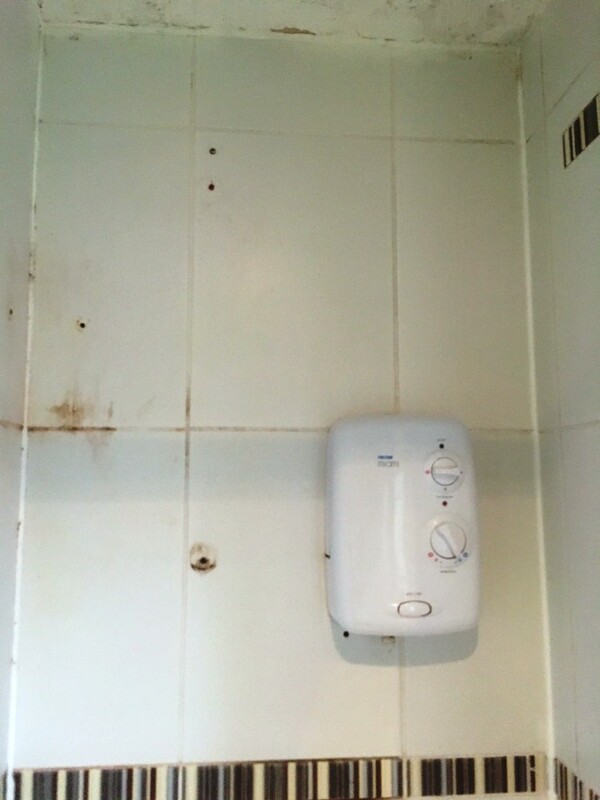 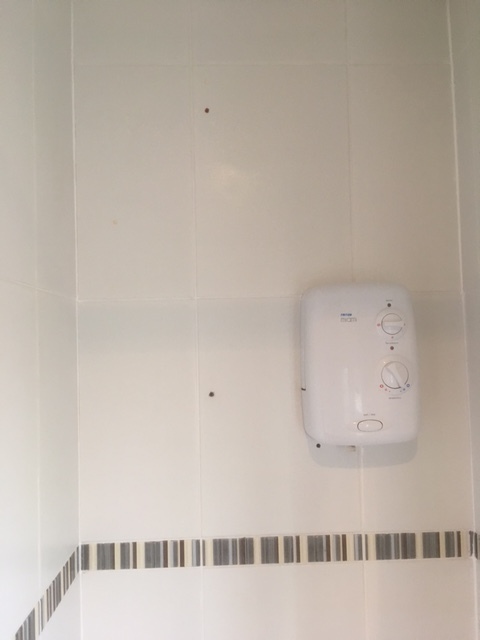 This is a great example of the difference we can make to a Shower Cubicle which suffer from a build up of soap scum, mould and staining from the dyes in shampoos and soaps etc. 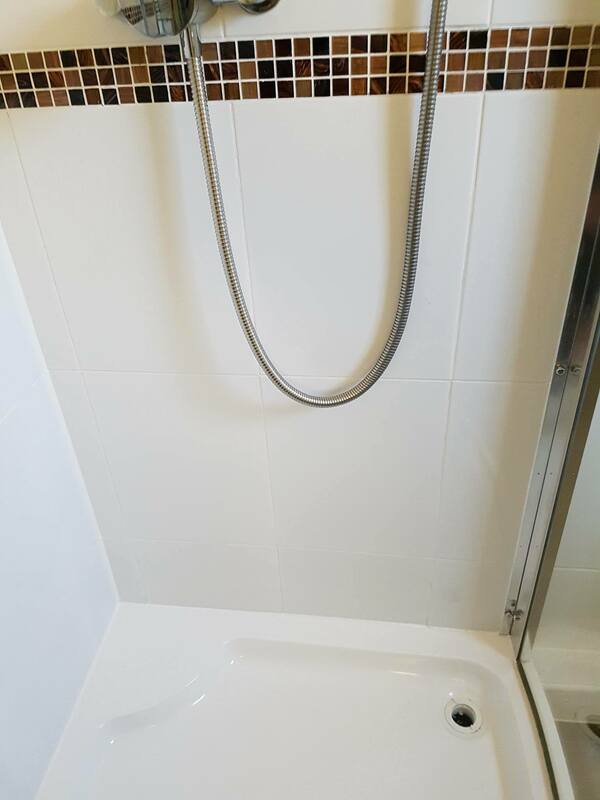 This particular cubicle was installed at a property in the city of Edinburgh. 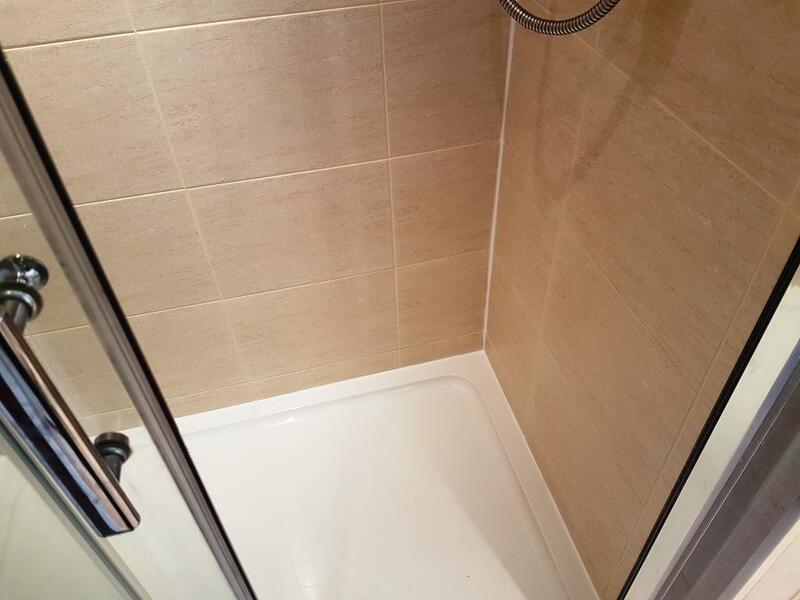 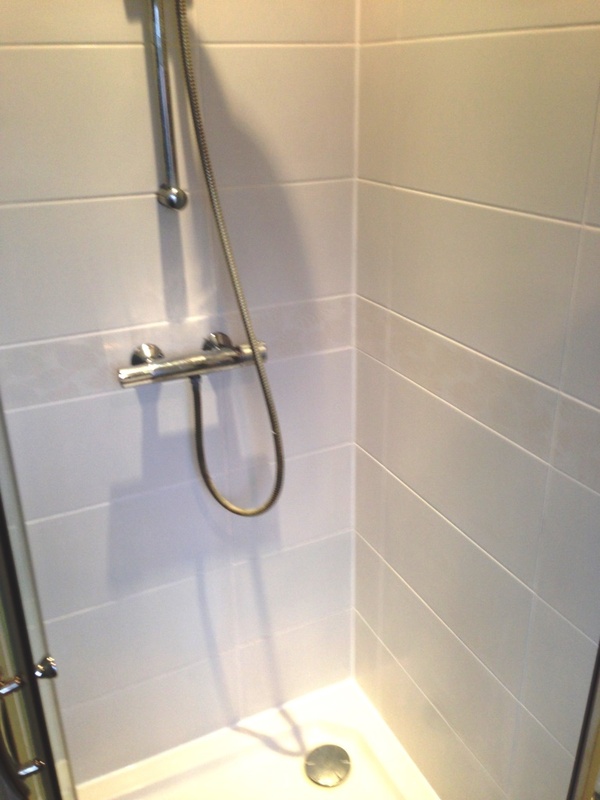 The walls were Ceramic tiles which are ideal for shower areas as the glaze makes them completely water proof. 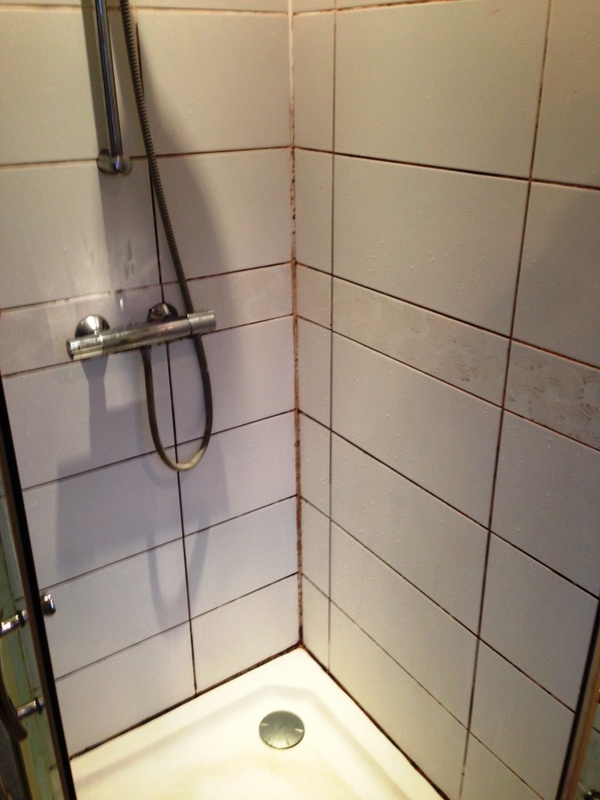 However with grout being cementitious it does attract dirt and this shower was no different. 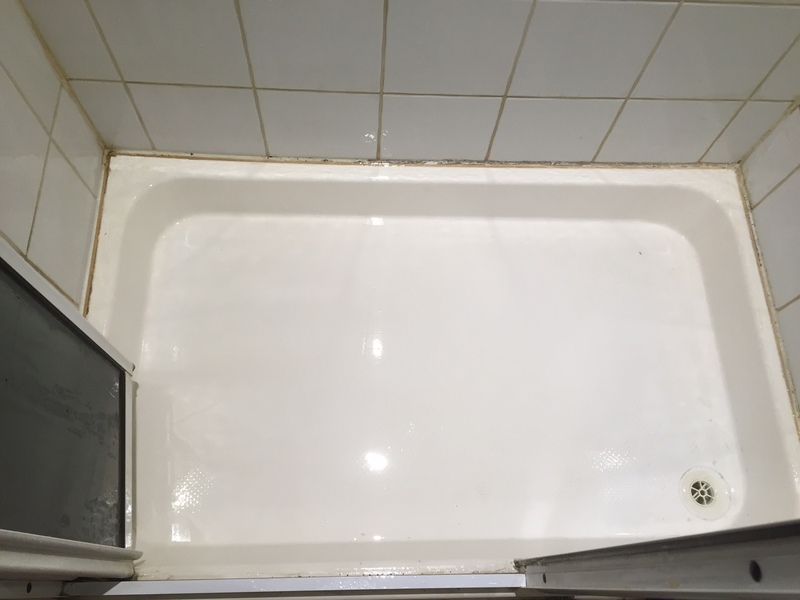 The first step was to remove the wire accessory holder and then soak all the tile and grout in a strong solution of Tile Doctor Pro-Clean. 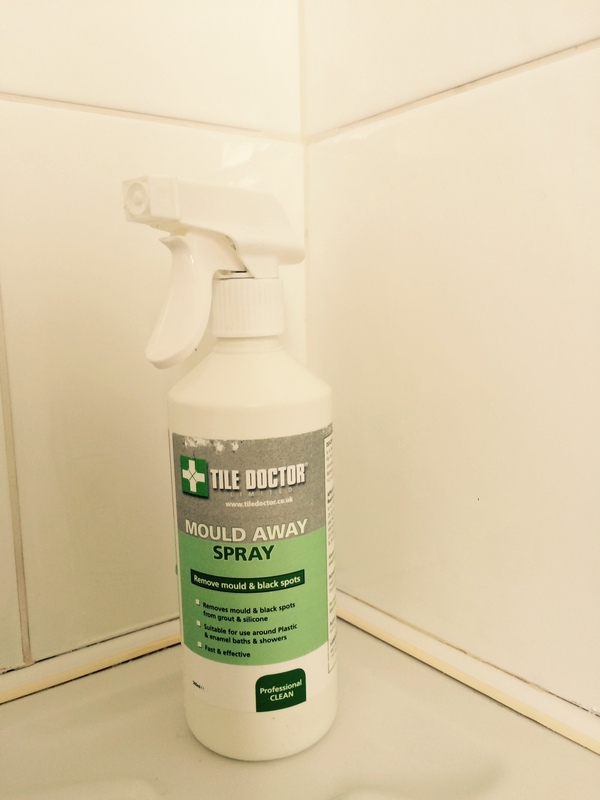 I find decanting into a spray bottle works best as it mixes it with air which makes it easier to stick to the wall. 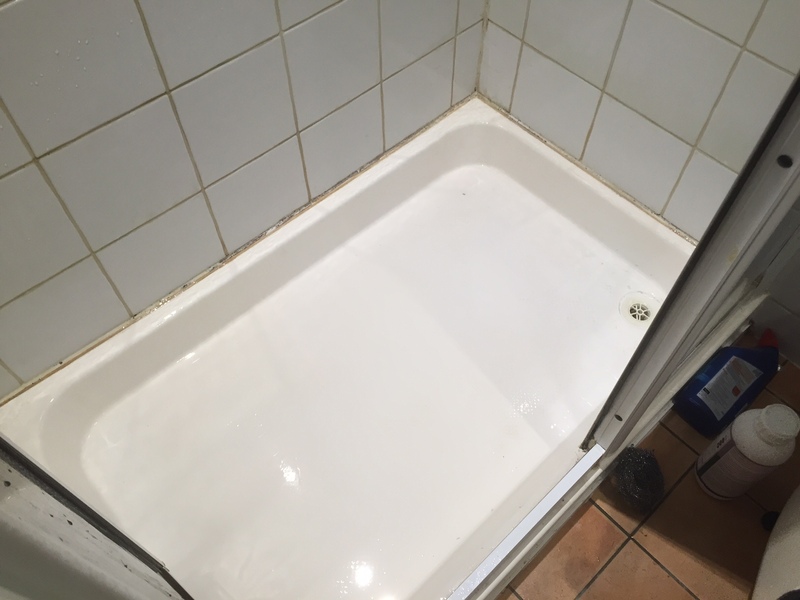 With the Pro-Clean in place it was then hand scrubbed to get the tile and especially the grout clean of all the mould and other stains. 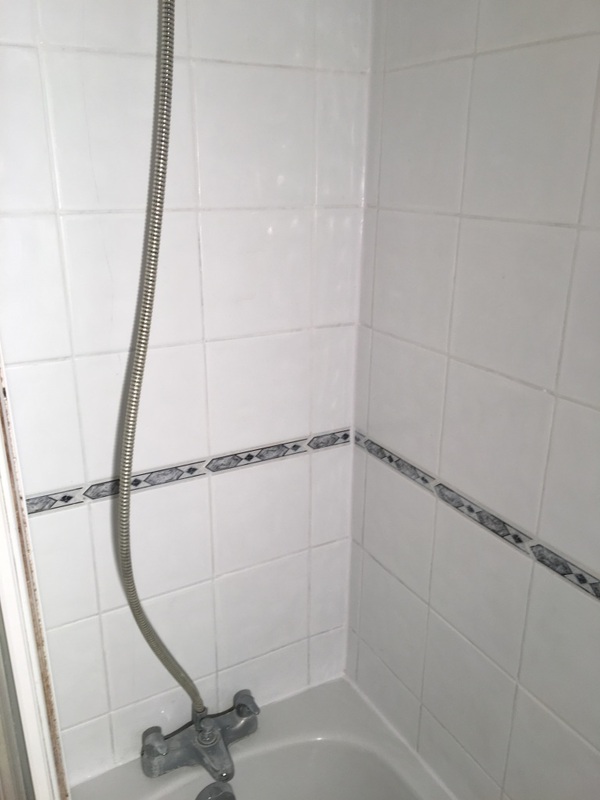 The shower walls were rinsed down and the process repeated where necessary. 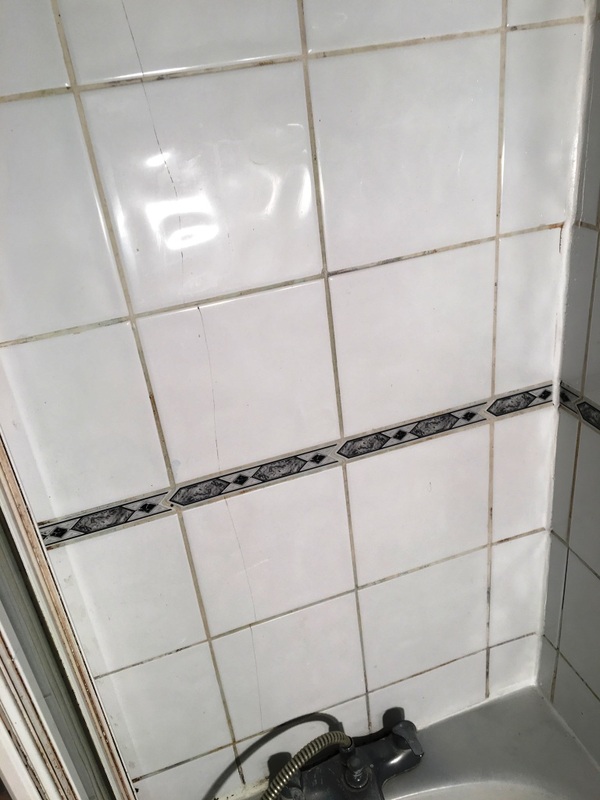 With the tiles and grout now clean we could see that the grout was still discoloured in some areas where it had been badly stained. 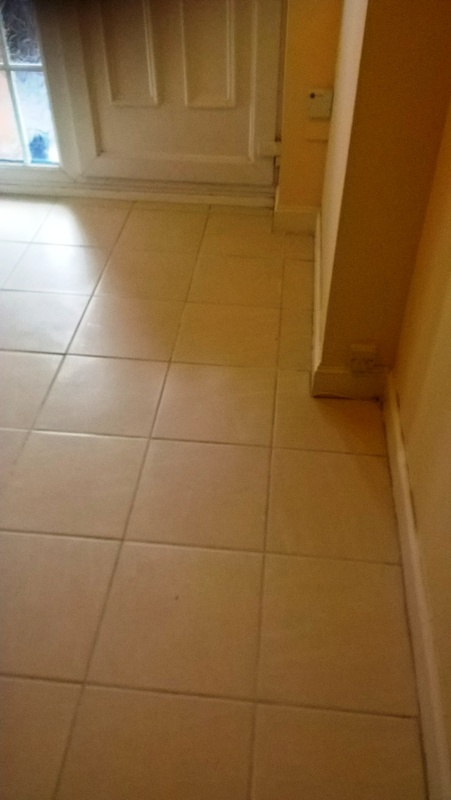 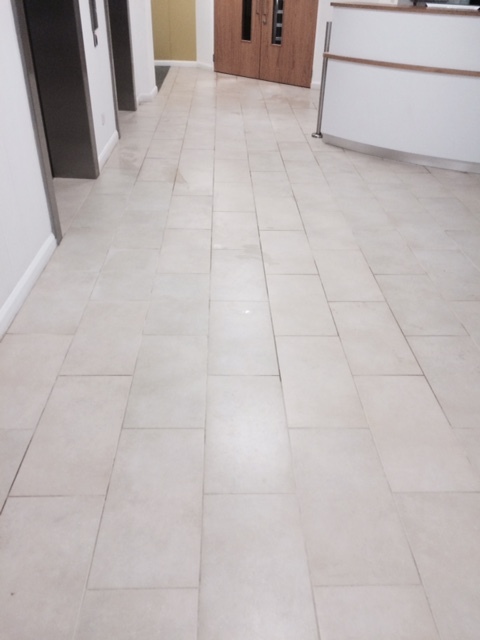 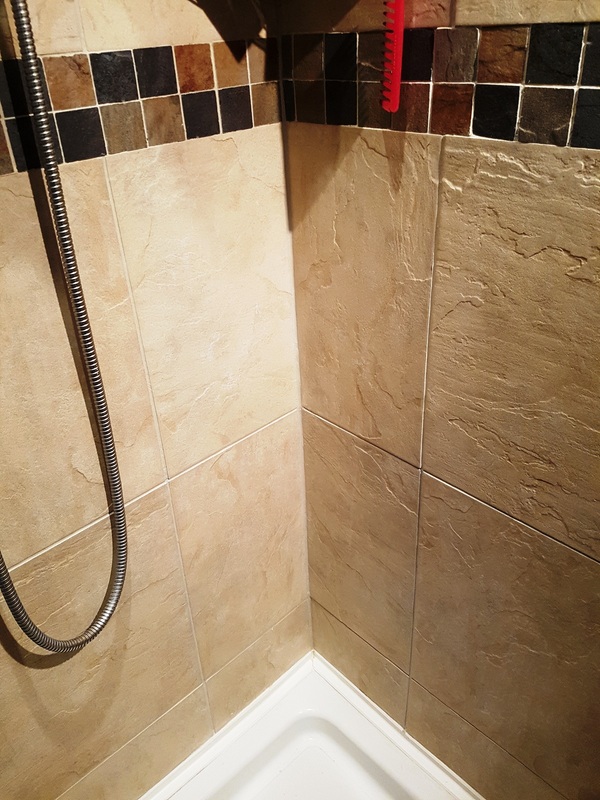 One option at this point would be rake out the grout and replace with new however overtime it would only discolour again, so in agreement with the customer we applied a grout colourant in a Limestone colour to better match the tile. 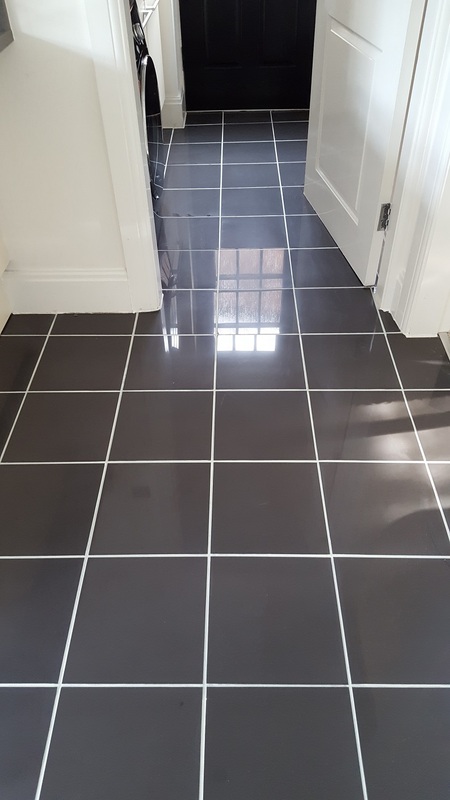 The Grout Colourant would ensure all the grout had a consistent appearance while also adding an impenetrable barrier that will keep its appearance for a long time. 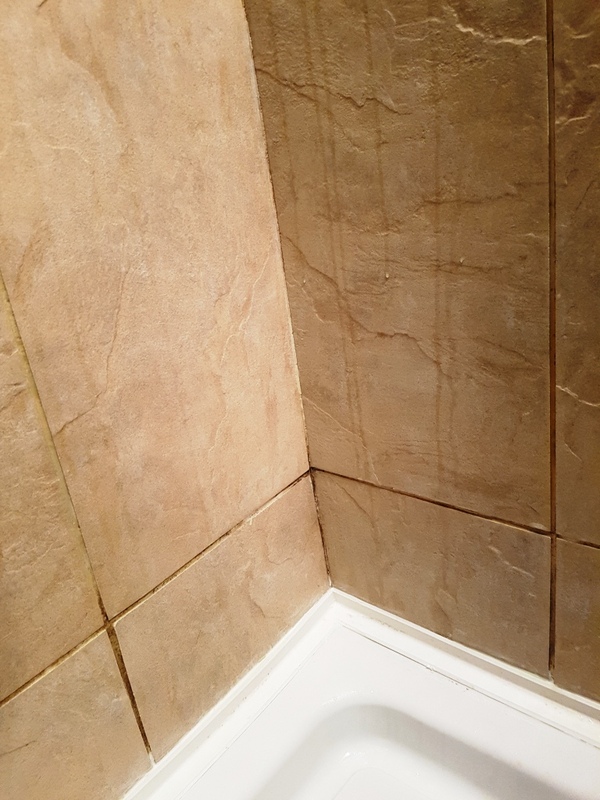 It takes a little time to do but is easily applied with a small brush and then you wipe off any excess that gets onto the tile. 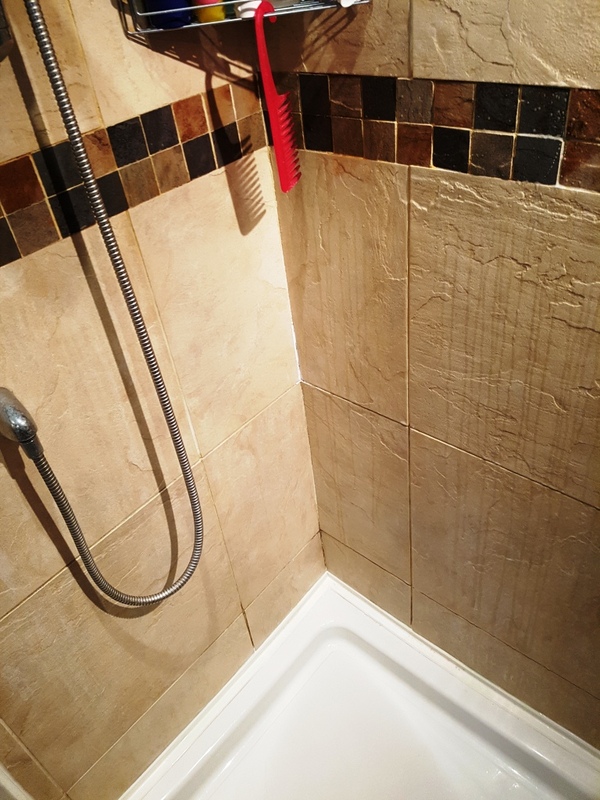 Deep cleaning and re-colouring the grout made a huge difference; the shower cubicle has been transformed and now looks like a new installation. 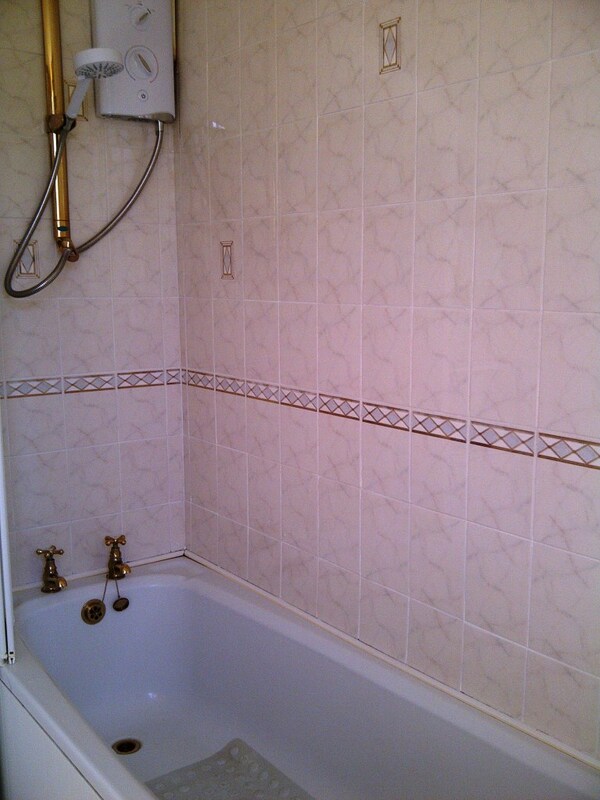 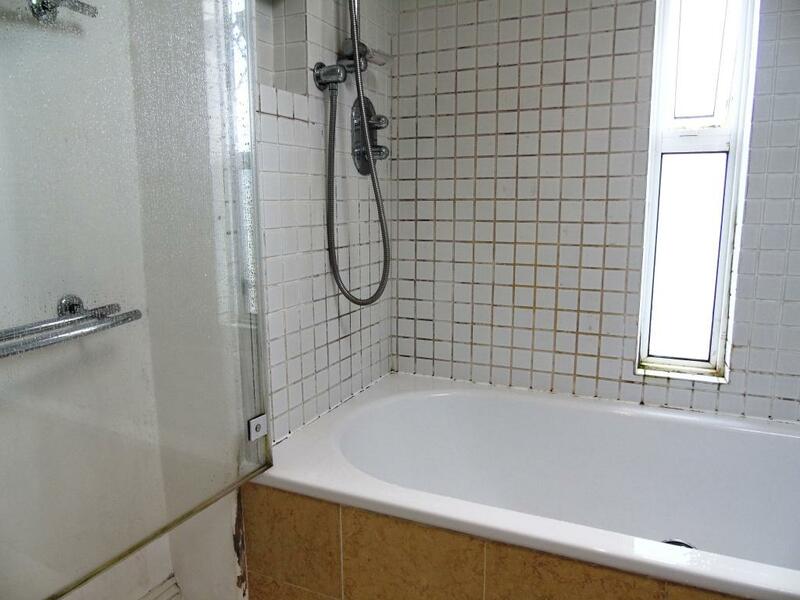 This Ceramic Tiled bathroom was at a house in the historic town of Cheltenham on the edge of the Cotswolds. 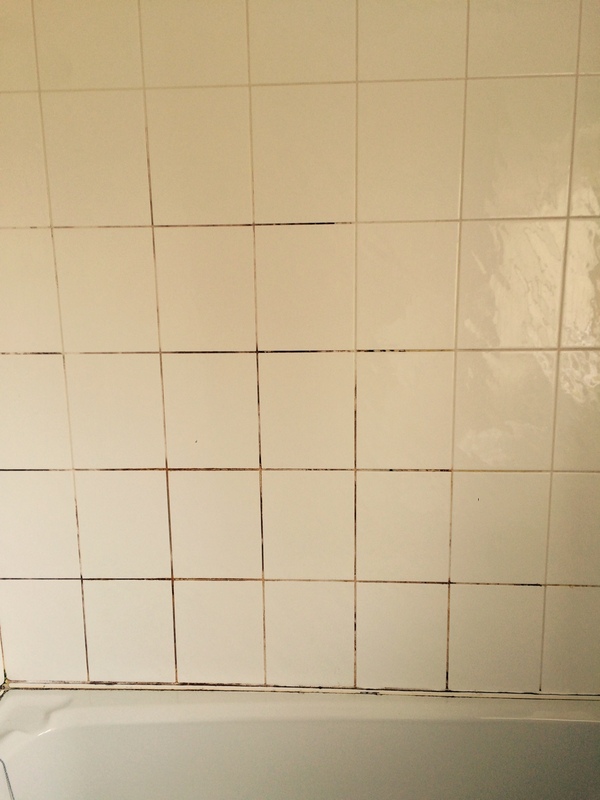 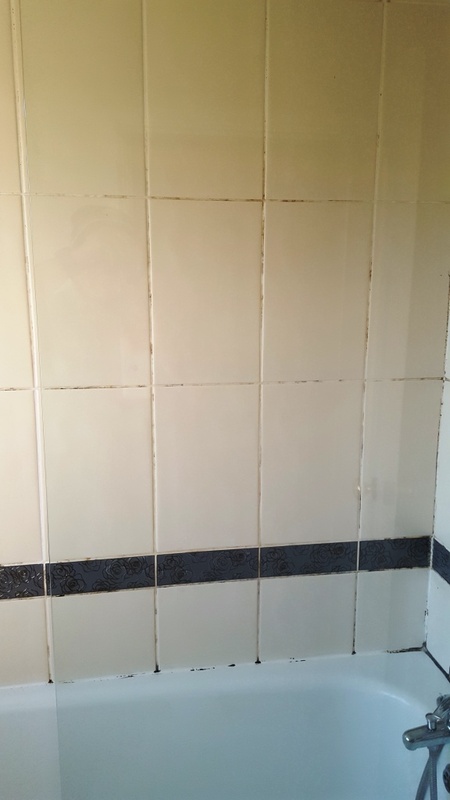 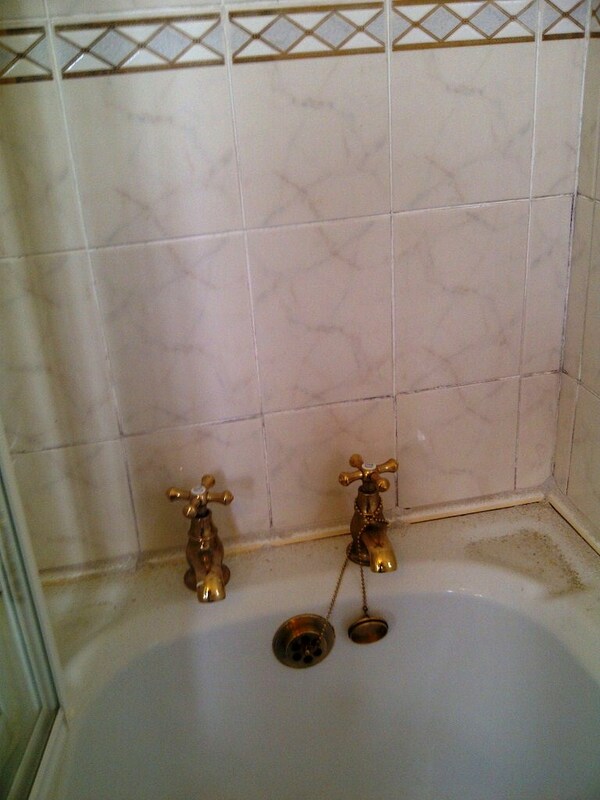 As you can see from the photograph below the grout between the Ceramic tiles was very stained and had attracted black mould. 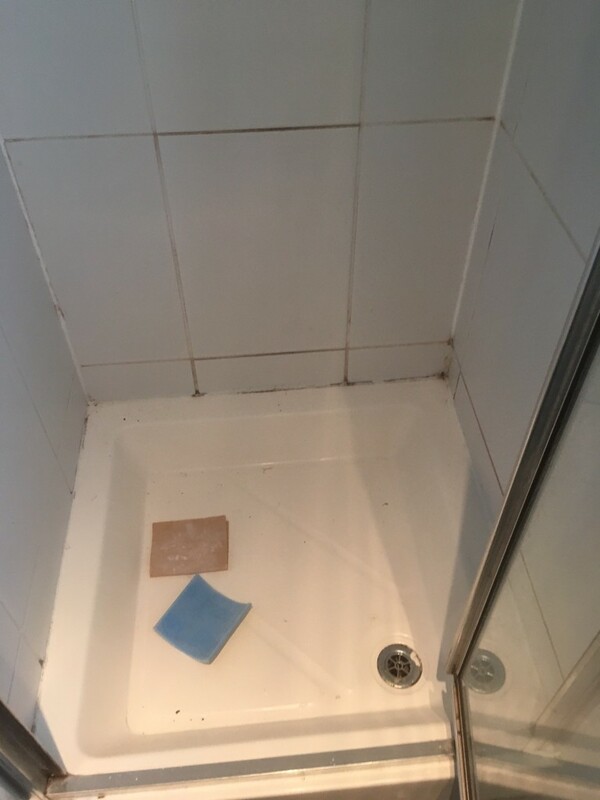 To get the tile and grout clean I sprayed on Tile Doctor Mould Away and left it to soak in for ten minutes before giving it a scrub with a stiff brush. 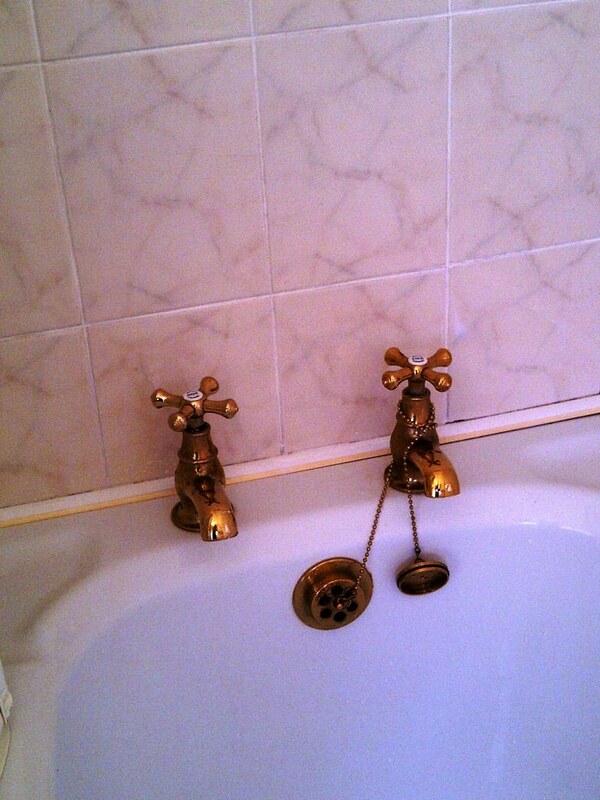 The resultant slurry was rinsed off and then the process repeated once more. 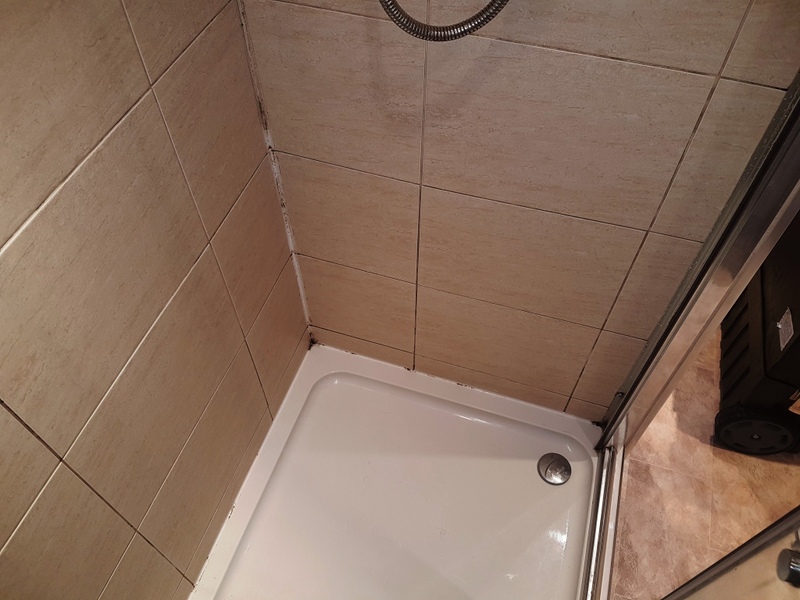 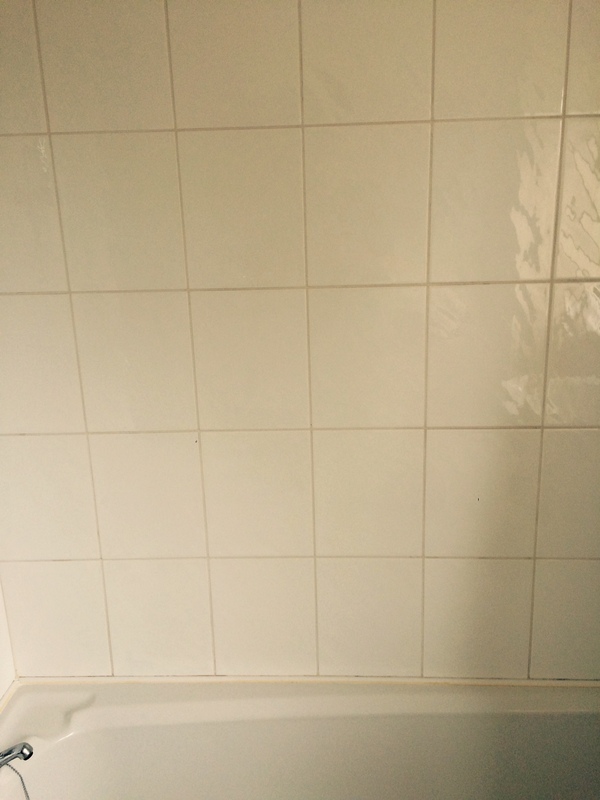 The Mould Away made a difference to the tile and grout however the grout was still not 100% white, so I recommended applying a grout colourant which I was confident would have the desired effect. 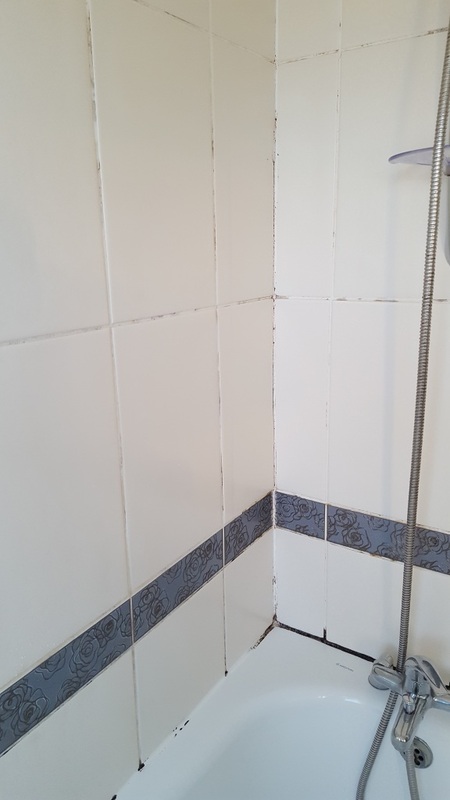 Two coats of white Tile Doctor Grout Colourant were then applied; this product is basically painted on top of the existing grout with any excess wiped off the adjacent tile before it dries. 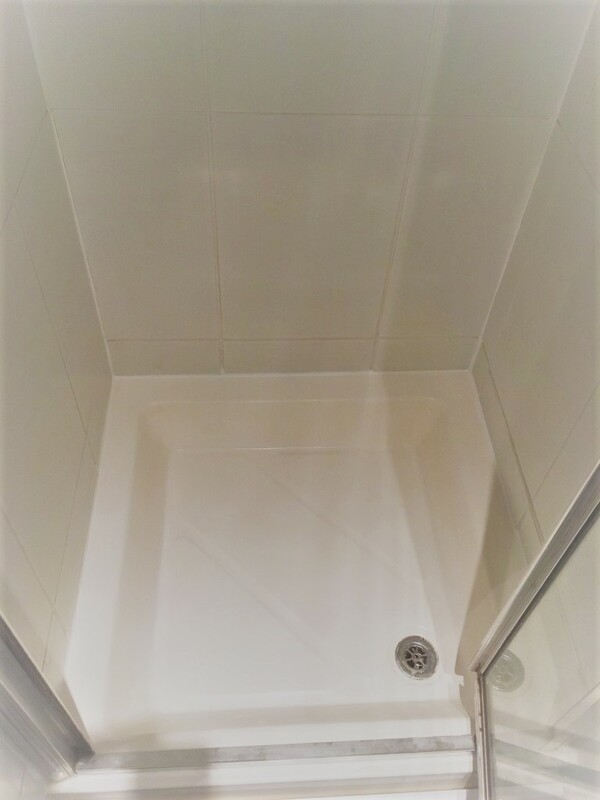 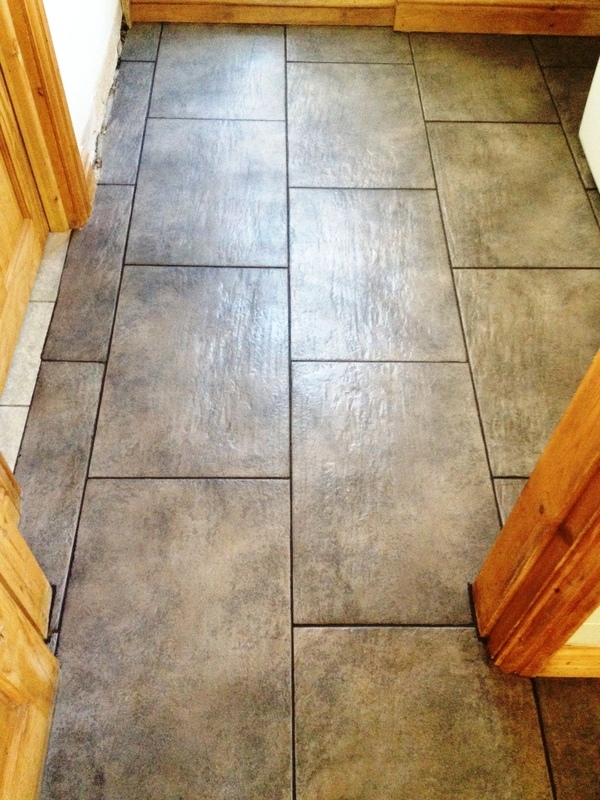 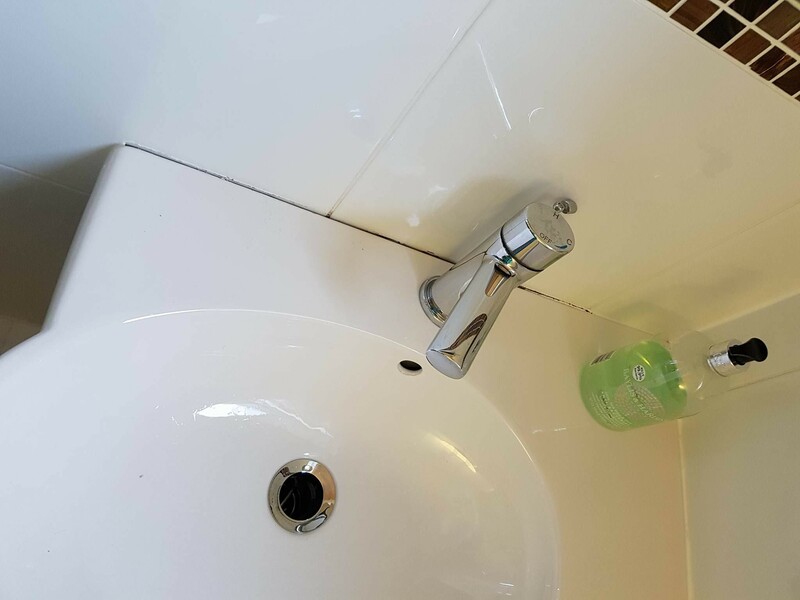 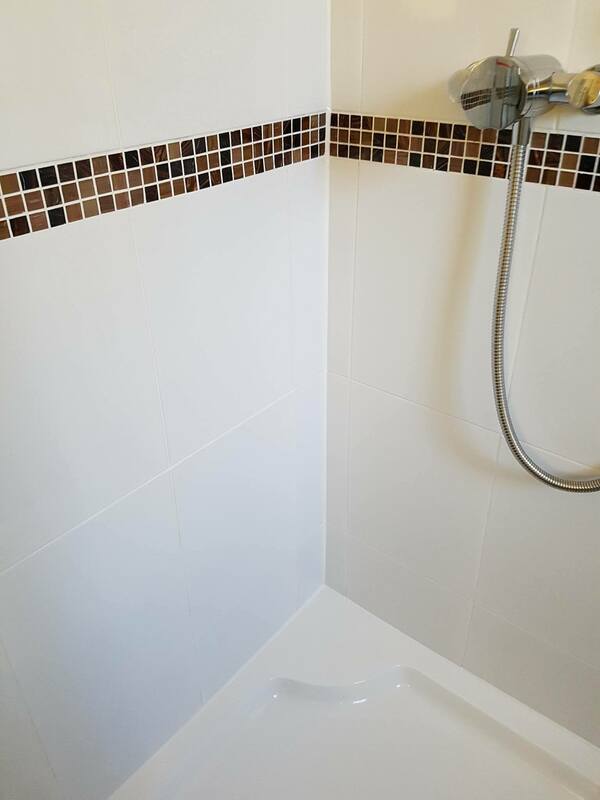 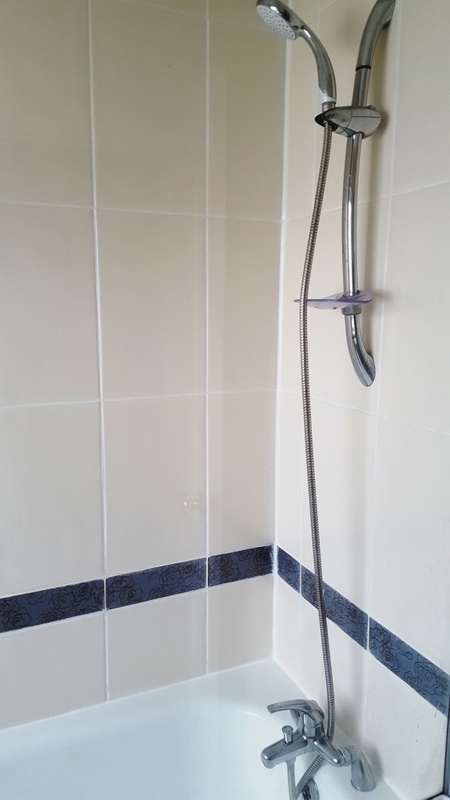 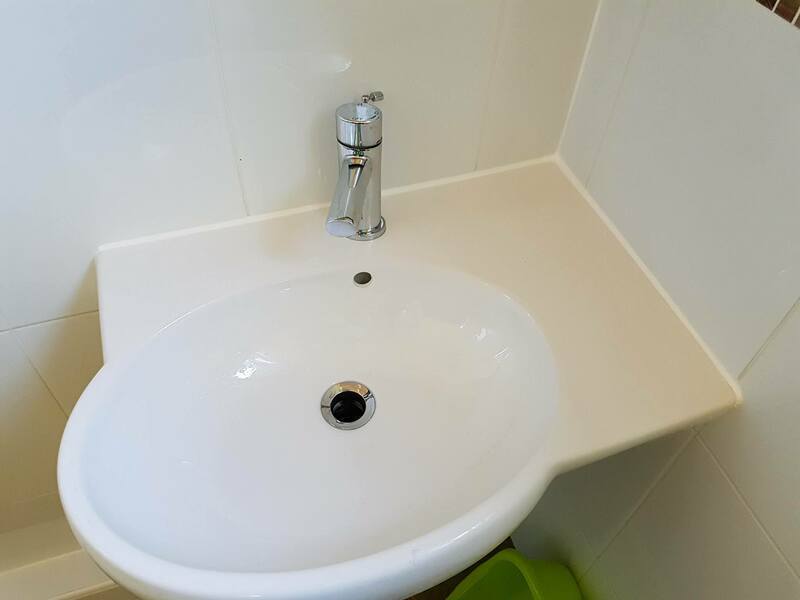 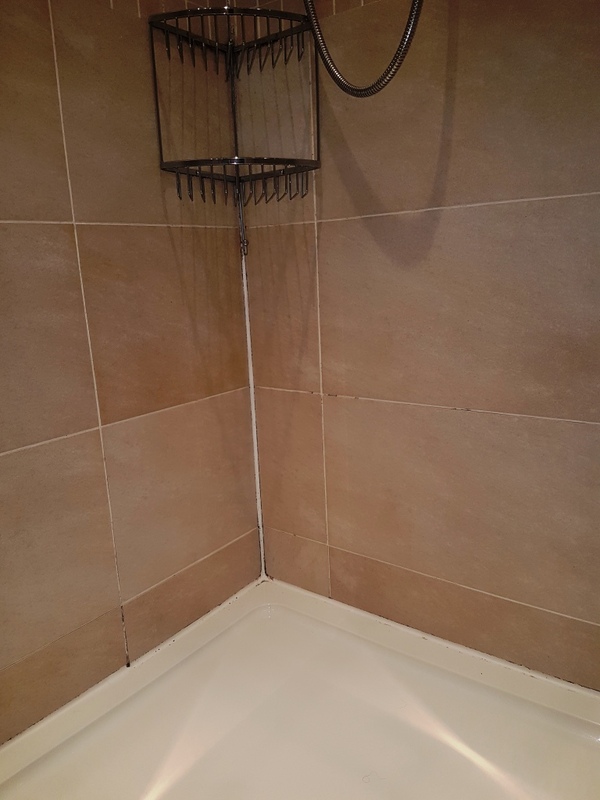 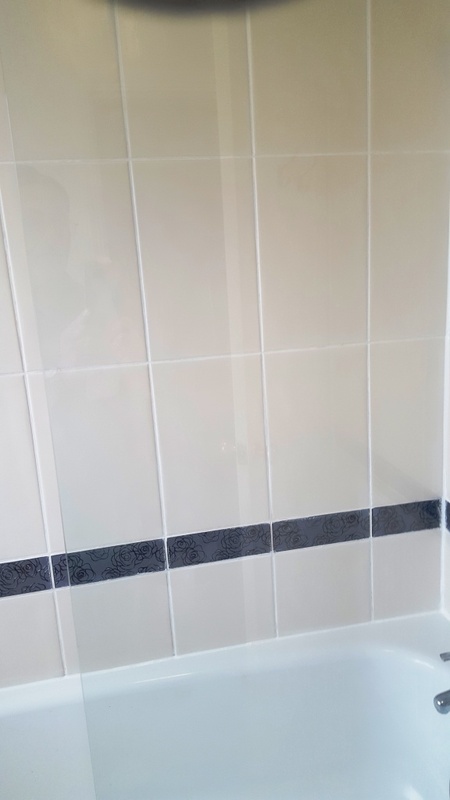 It’s an epoxy based formula that becomes a long lasting barrier protecting the grout and also making it much easier to clean, it looks natural and I think you will agree it has made all the difference in fact the customer commented that it looks like a new bathroom. 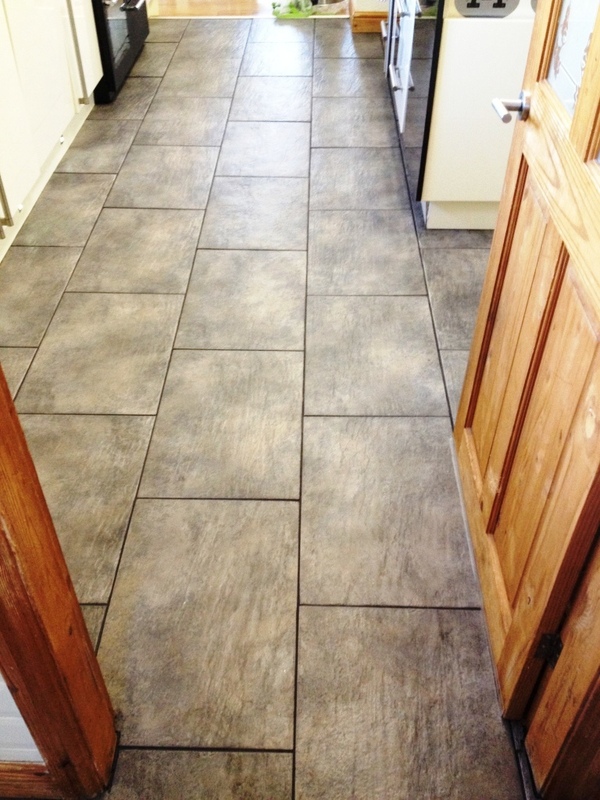 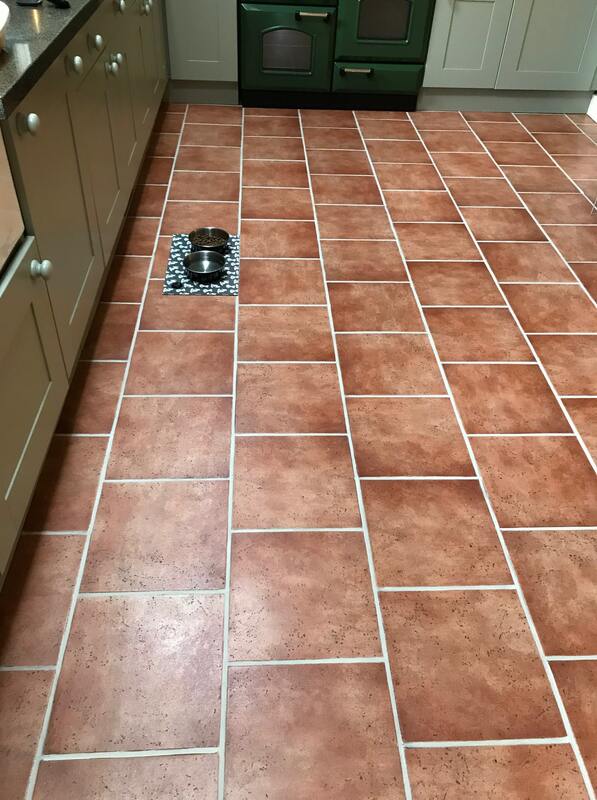 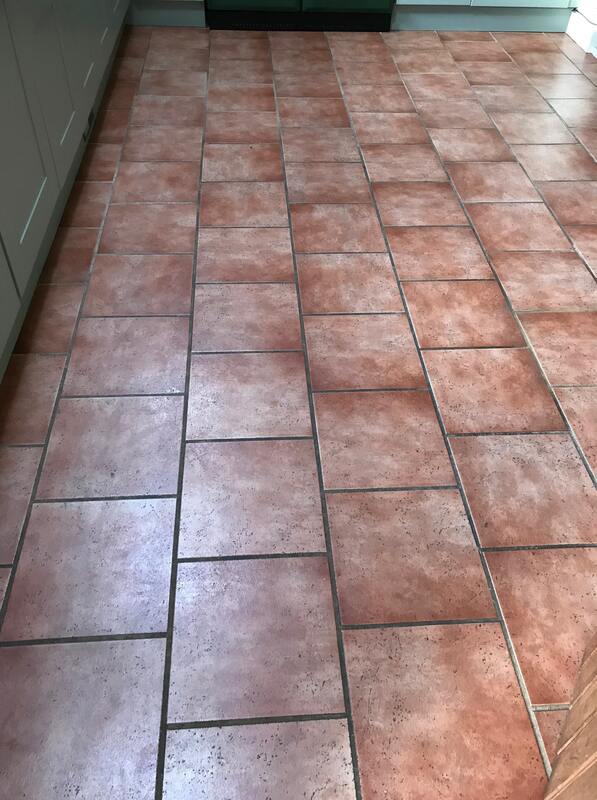 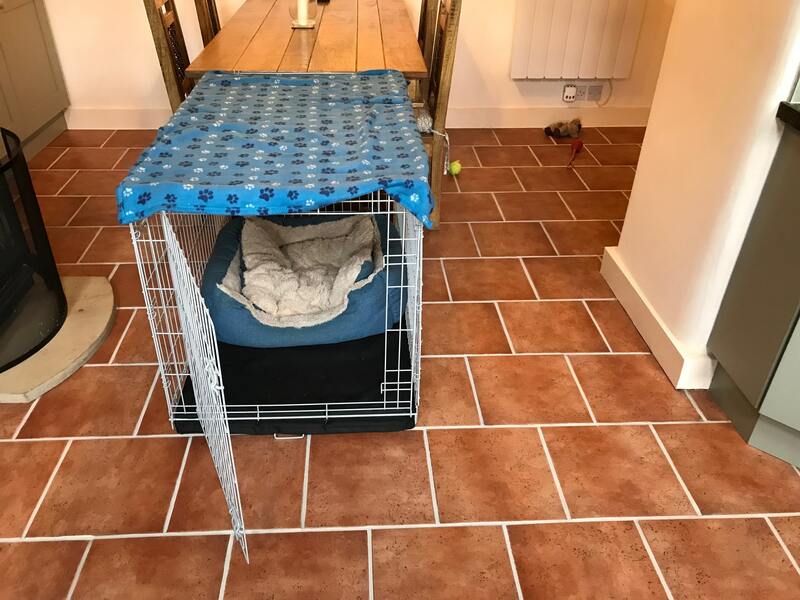 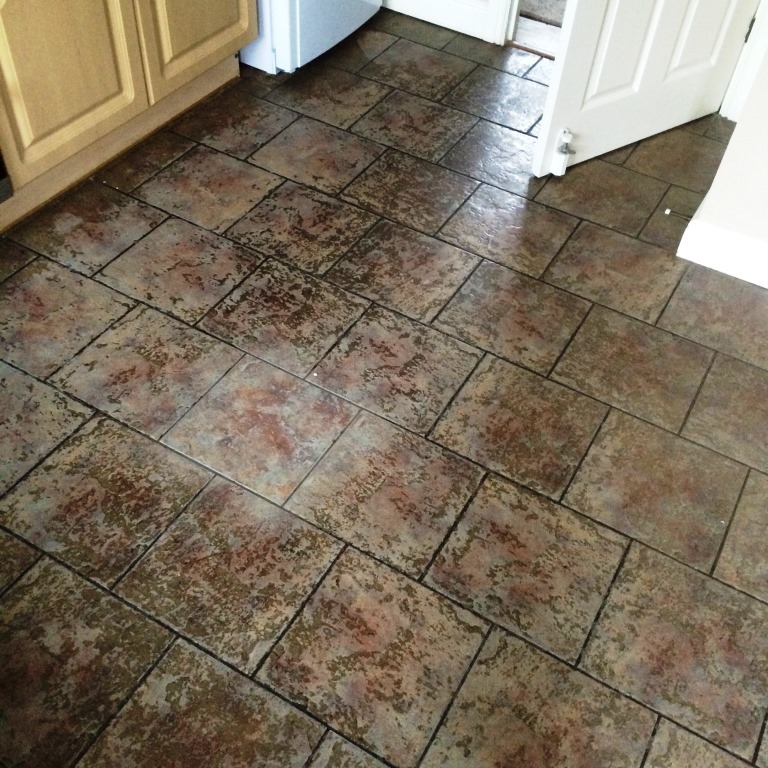 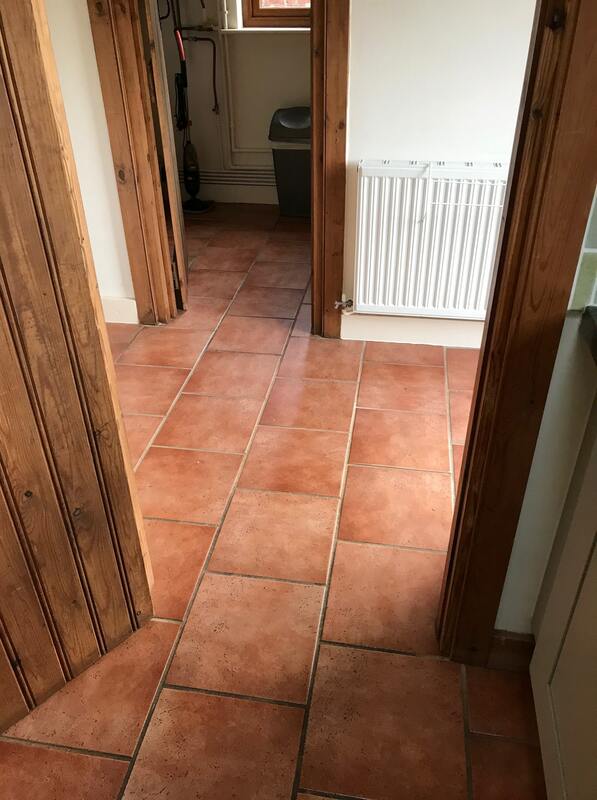 This is a great photograph of a Ceramic tiled kitchen floor in at a house in the village of Blaby, in the centre of Leicestershire, that had at some point in its past had been incorrectly sealed with an acrylic topical floor polish. 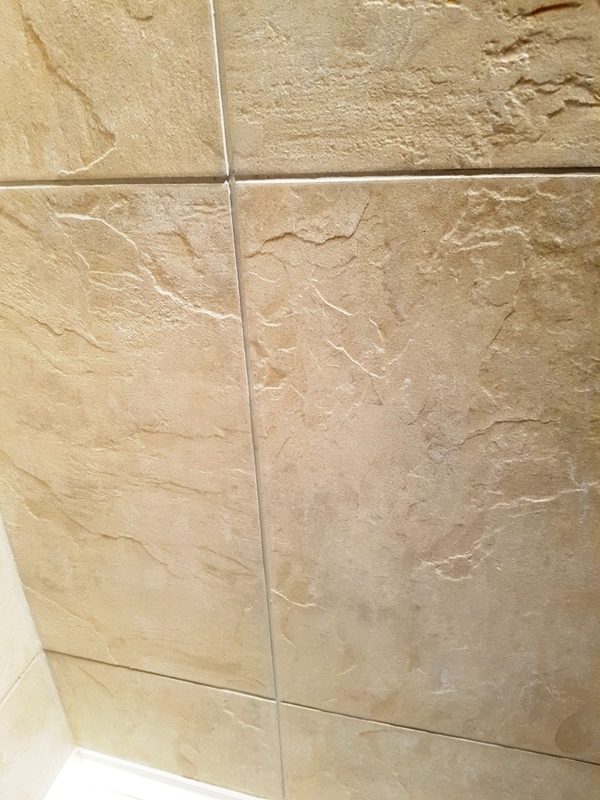 Ceramic tiles are glazed and don’t need sealing, nor usually will they accept one as the glaze make it difficult for anything for adhere properly and so this treatment should never have been applied. 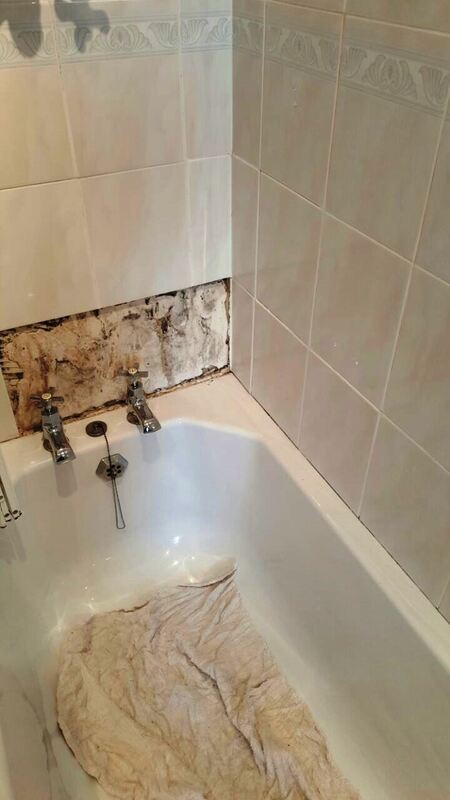 Needless to say it didn’t work out as over time the coating had become worn, damaged and heavily soiled. 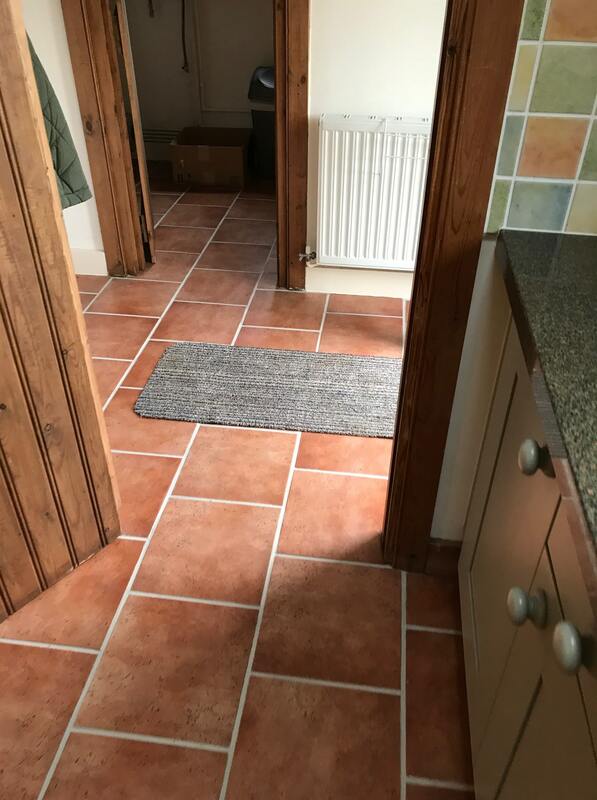 Before starting we made sure the floor was clear of any obstructions and we removed the kick boards around the bottom of the kitchen units to ensure they would not get scuffed or damp during the cleaning process. 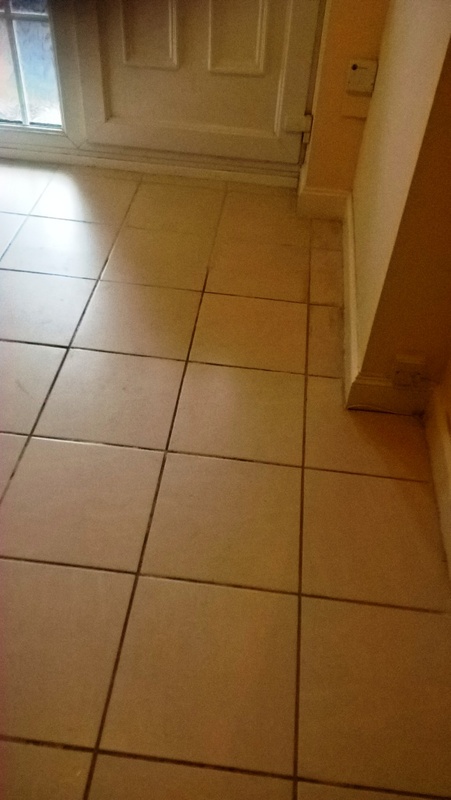 To get the floor clean again the old polish that was now heavily soiled would have to be removed so a strong dilution of Tile Doctor Remove & Go was applied to the floor and left to soak into the floor in-order for it to get to work breaking down the polish. 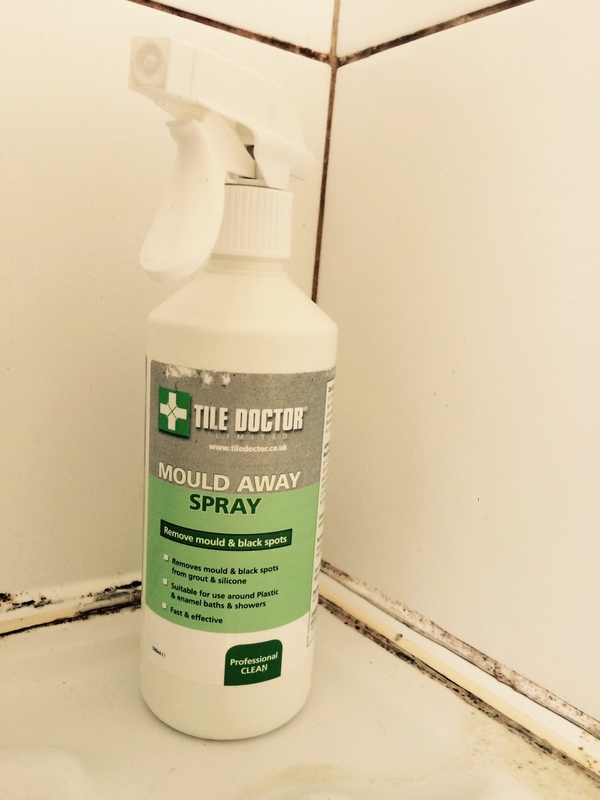 Remove and Go is a specialist product produced by Tile Doctor that is safe to use on Tile and Stone and pretty much does what it says on the tin for the removal of coatings such as sealers etc. 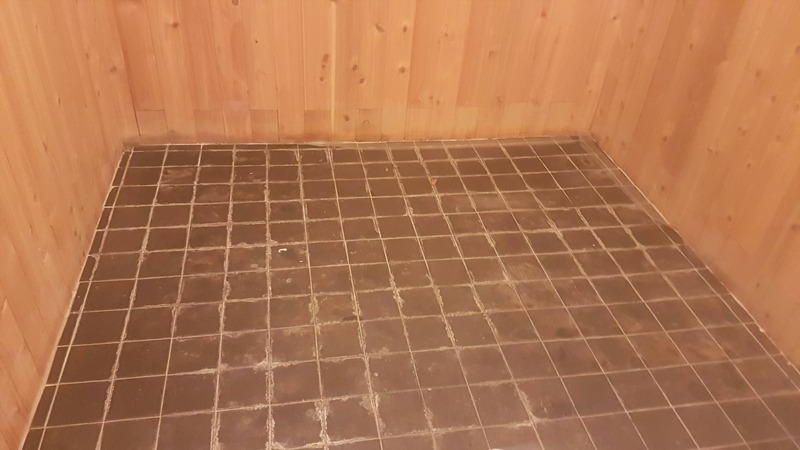 After leaving the solution to dwell for thirty minutes the Remove and Go was scrubbed into the floor using a black scrubbing pad fitted to low-speed weighted rotary machine. 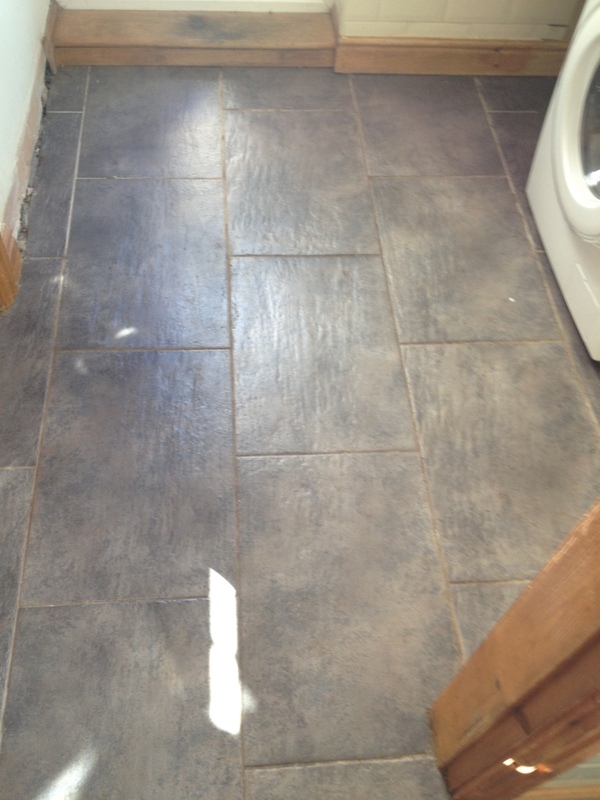 The grout lines were also scrubbed thoroughly by hand using a grout brush. 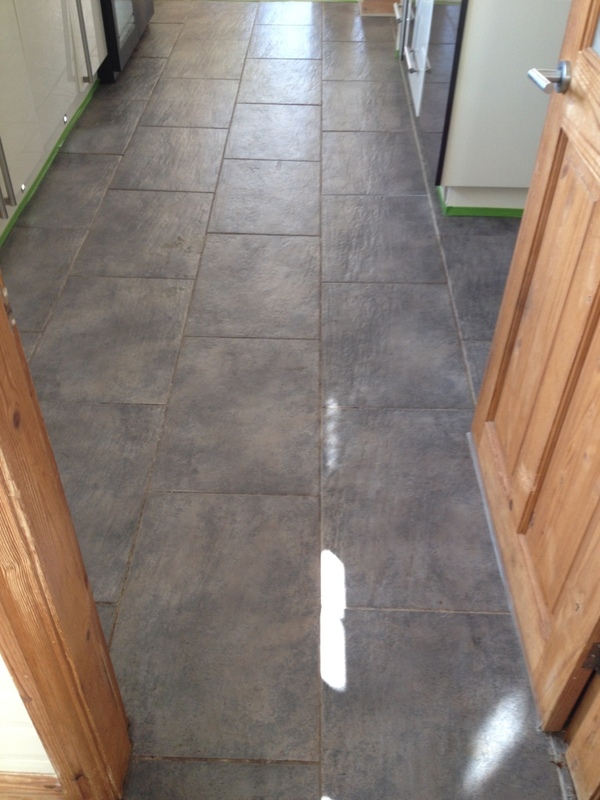 The floor was then rinsed and the resulting slurry and cleaning residues removed using a wet vacuum. 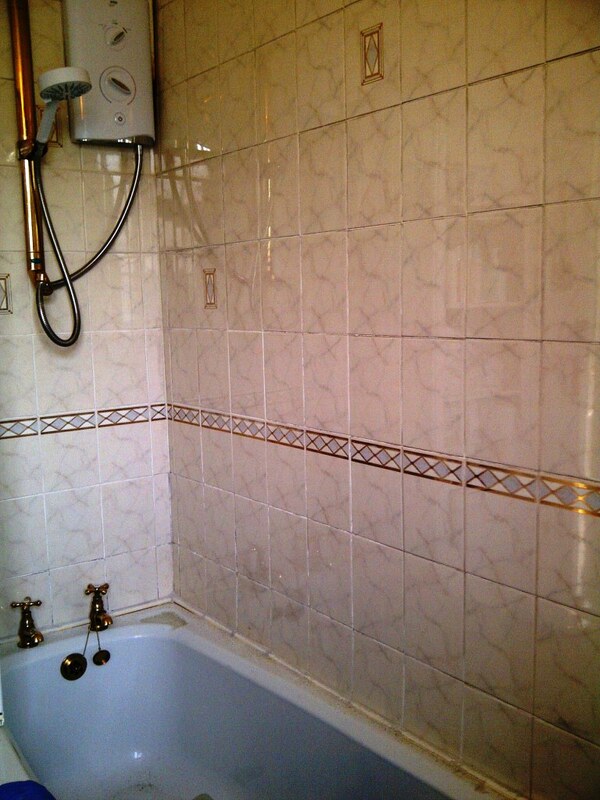 The floor was inspected at this point and any stubborn areas were spot treated using the same process. 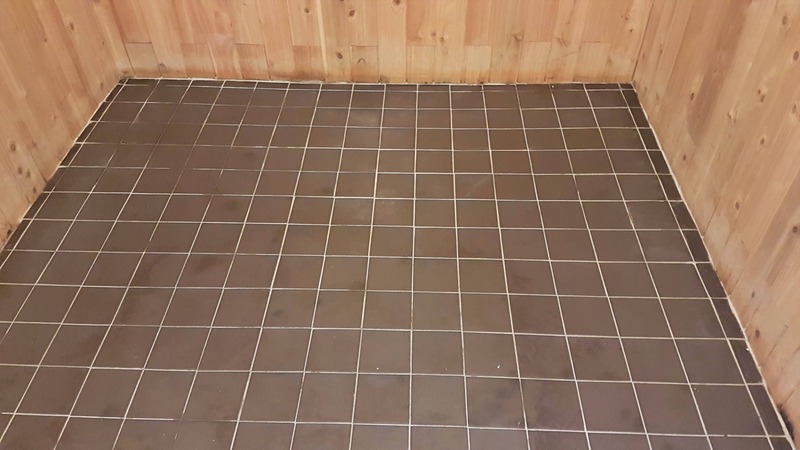 The floor was now clean again and looking as it should, the only thing left to do was to dry the floor which we did with the aid of a force air drying machine and then refit the kickboards to the kitchen units. 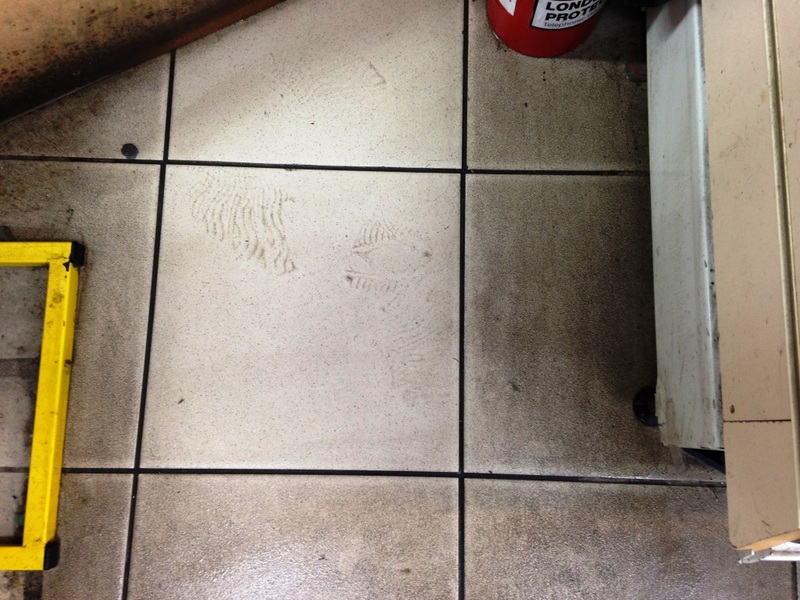 Photographs below from a Mini-Market in Lewes where high foot traffic was taking its toll on the Ceramic tiled floor which was now is need a dramatic deep clean. 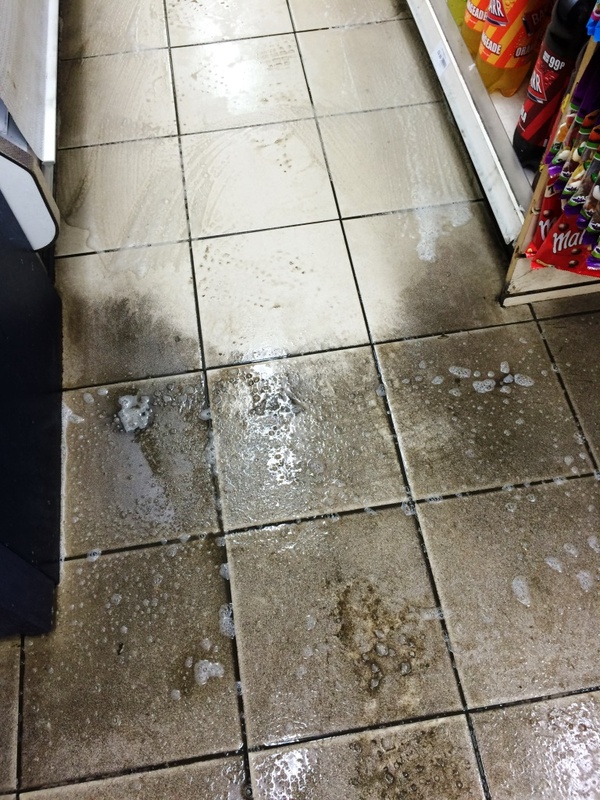 As the shop is open from 6am-11pm I had to work through the night. 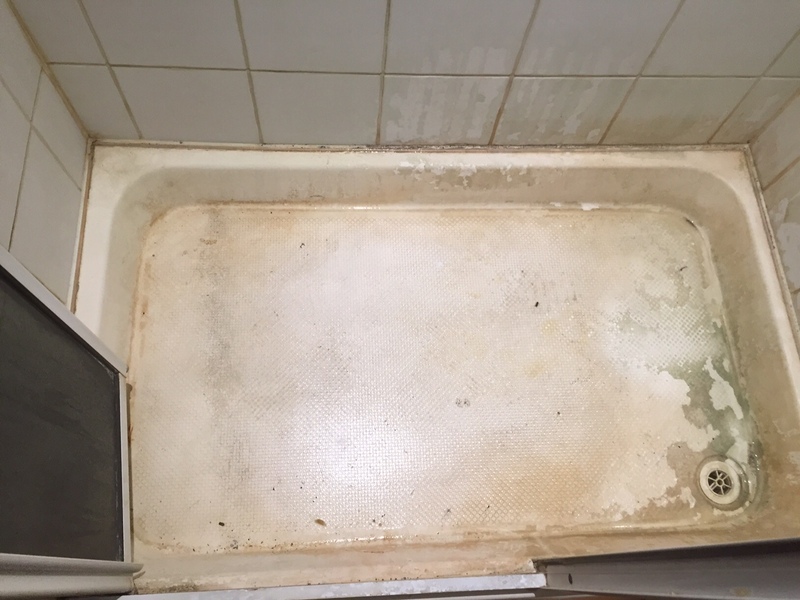 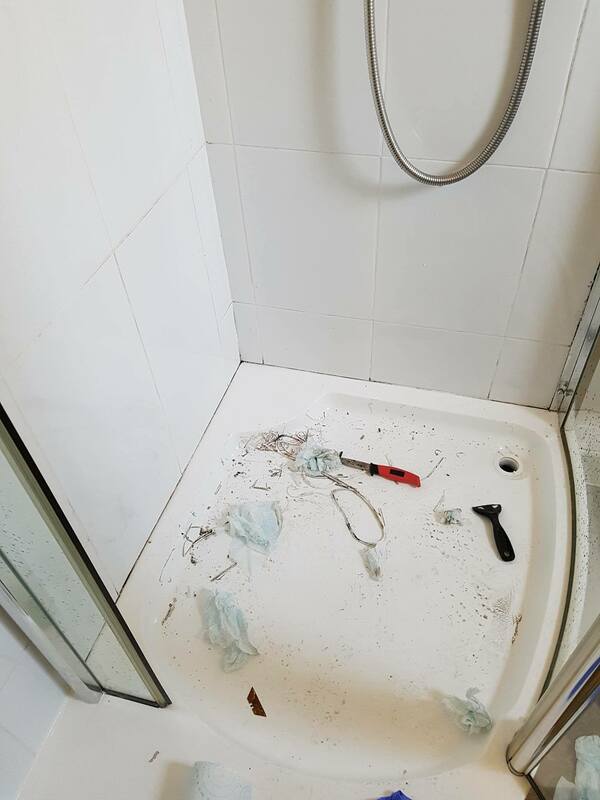 I started by applying a medium dilution of Tile Doctor Pro-Clean to shift the muck, this was left to soak in for a while before being scrubbed into the floor using a buffing machine fitted with a scrubbing pad and stiff brush along the grout lines. 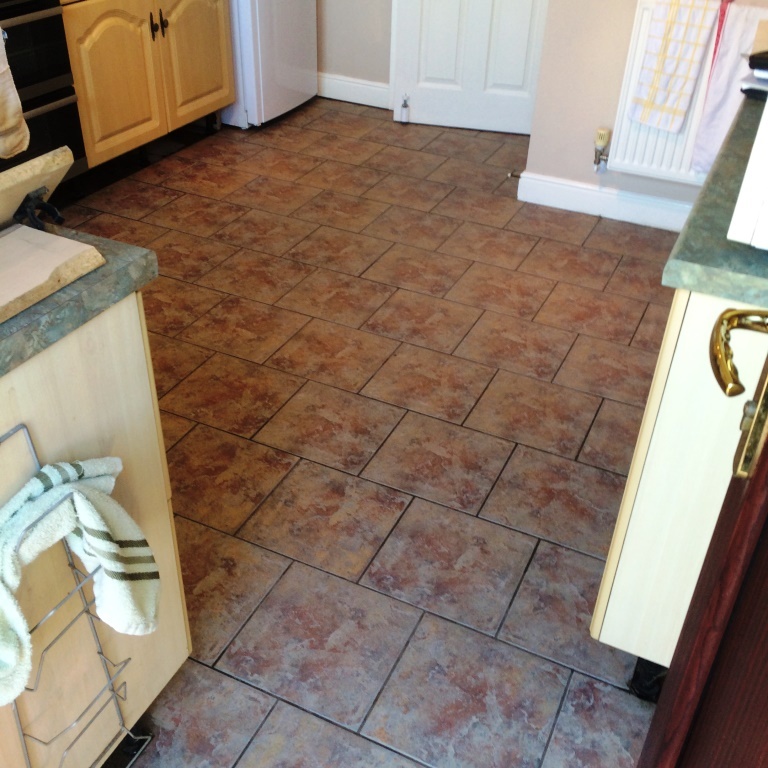 The floor was then rinsed with warm water which was then extracted using a wet vacuum. 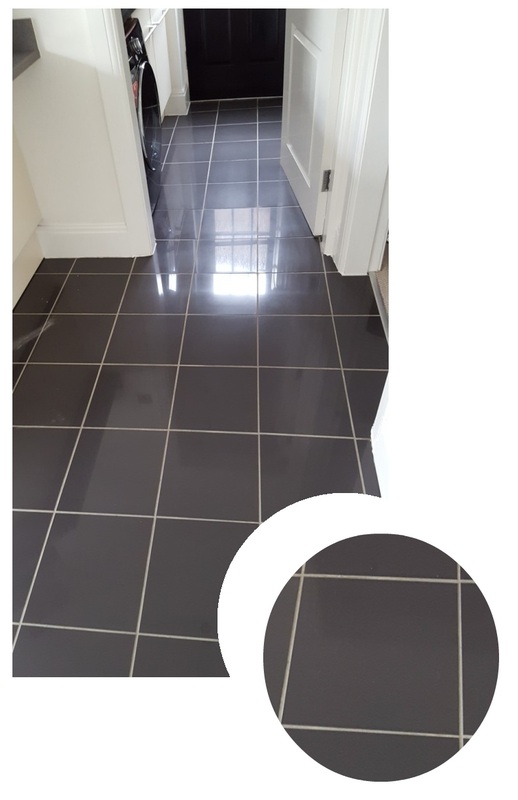 I had to repeat the process in stubborn areas but as you can see from the pictures the result was incredible, just look at the pictures! 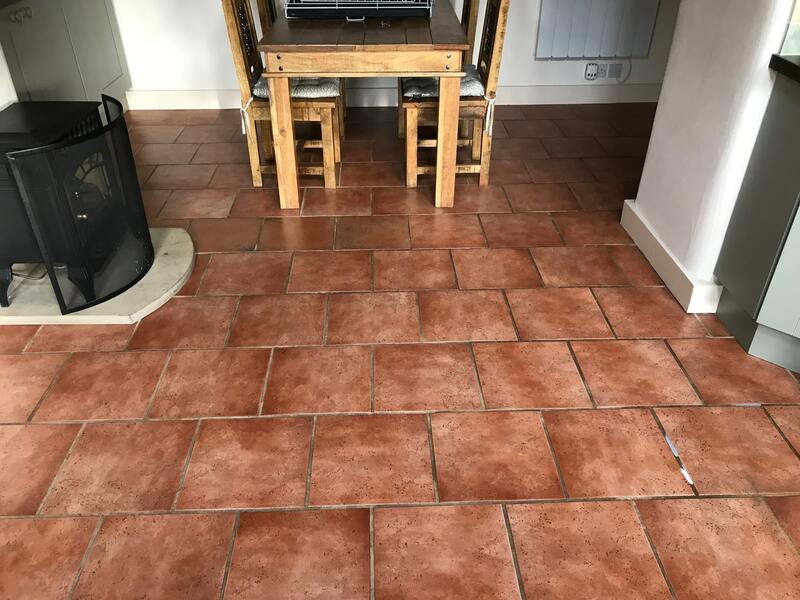 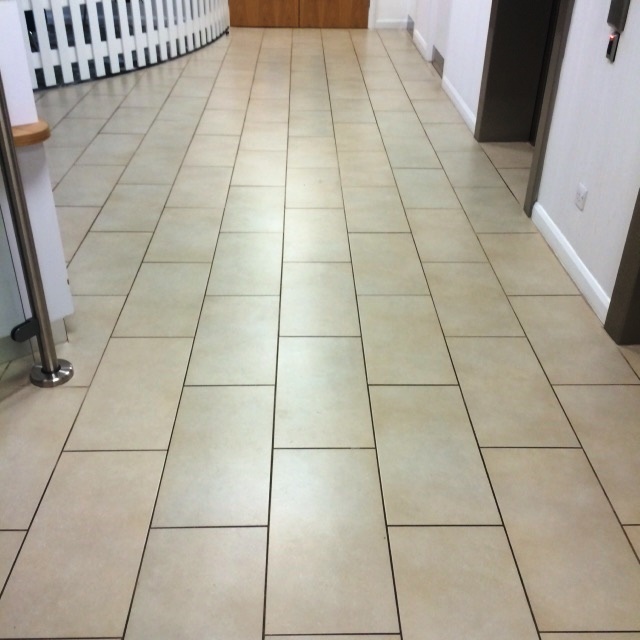 Ceramic tiles are glazed so do not need sealing and as there is no sealer the floor can now be maintain using a regular floor cleaning product. 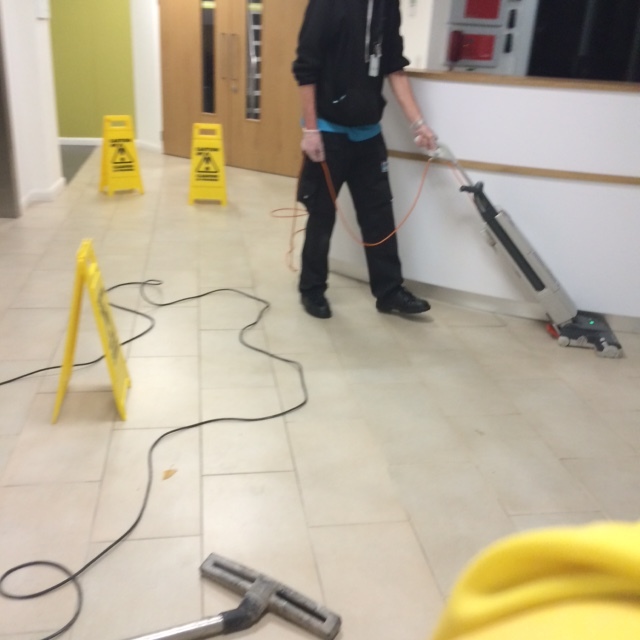 Hopefully they can keep on top of the cleaning however it is a busy floor with hundreds of people walking on it every day so if they do struggle we are always happy to do a regular maintenance clean for them.